This week saw a committment from the Scottish Government to establish a financial redress scheme for in-care abuse survivors, plans to strengthen the home detention curfew system and the launch of a new play highlighting to young people the dangers of knife crime. 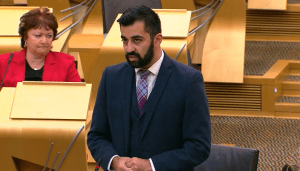 Cabinet Secretary for Justice Humza Yousaf was at the Parliament’s Justice Committee this week, responding to MSPs’ pre-budget scrutiny questions about the resourcing of key justice and community safety services. Watch the Cabinet Secretary’s appearance at Committee session in the video linked below. On Wednesday the Justice Secretary visited Stewarton Academy, Ayrshire, for the national tour launch of the No Knives, Better Lives ‘Balisong’ play, which highlights the dangers of knife crime. The Scottish Government is providing an additional £25,000 to YouthLink Scotland this year to ensure that ‘Balisong’ will be seen in every local authority throughout 2018-19, including a showing in HM Young Offenders Institute Polmont. Real pleasure watching #Balisong – it did almost have me greetin'! Powerful, hard-hitting and communicates such an important msg for our young ppl on the dangers of carrying a knife. A financial redress scheme for survivors of child abuse in care will be put in place, Deputy First Minister John Swinney announced to Parliament this week. Mr Swinney was outlining the Government’s response to the recommendations of the InterAction Action Plan Review Group on the provision of financial redress for victims and survivors of abuse in care. Mr Swinney and First Minister Nicola Sturgeon met members of the Group just ahead of his Parliamentary statement and thanked them personally for their commitment, time, and collaborative approach to this work. Read the Deputy First Minister’s statement on the main Scottish Government website, or watch proceedings on the Scottish Parliament YouTube channel. The Justice Secretary confirmed plans to strengthen the system of allowing some prisoners to serve part of their custodial sentence outside prison with a ‘home detention curfew’ (HDC) electronic tag. Mr Yousaf announced immediate actions were being taken by the Scottish Prison Service, Police Scotland and the Government after receiving two independent inspectorate reports into the HDC regime. On Friday Minister for Community Safety Ash Denham visited Gracemount High School, Edinburgh, to see pupils taking part in a ‘Girls Only’ School of Football – supported by the Government’s Cashback for Communities programme that invests the proceeds of crime into projects that support Scotland’s children and young people. The Scottish Football Association currently receives £1.75 million to deliver their Phase 4 (2017-20) Cashback programme – which includes the School of Football programme for girls and boys. The SFA has developed the ‘Girls Only’ Schools of Football to deliver a range of benefits, including developing self-confidence and social skills. Some amazing young girls in the project and thank you to @PEGracemount for all the support.